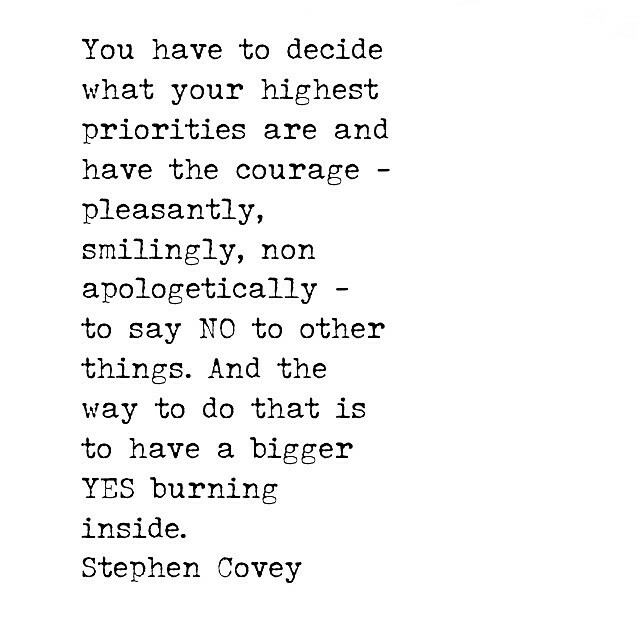 It’s my year to commit myself to my highest values and say YES to the things that fall in line with those. Years prior to 2014, I was a “yes” in a different way. I would sign up for all of the things asked of me and more, in search of acceptance and love. I was trying to prove myself as a “do-it-all” type of woman, to make up for my past mistakes. I had something I wanted to prove: that I was worthy of love, that I was a good mother, a good person. That I had changed. I have nothing I need to prove any longer. I am proud of who I am and the life I lead. I now place little to no importance on the opinions and judgments of those outside of myself, my family, and my friends who are close enough to be considered my village. In 2014, I began to say no. By considering the amount of time I had allotted and saying no to things I couldn’t include, I came to realize how often I was saying yes in times that weren’t of service to me, my family or my community. In saying no and setting boundaries, I saw how people without boundaries were unnerved by this. I saw their frustration, and their passive accusations that I wasn’t doing enough. My Family, first and foremost those who live beneath my roof or will one day. Following that, those who do not. My Health, regarding eating healthfully and achieving athletic milestones I set for myself. It is through these acts, I have found, that I live with a higher quality of mental health and am better able to show up in the ways others need me to. Acquiring Knowledge by travelling well, reading often, and learning new skills. Creating solutions and art through any medium, including the written word. And I’m committed to map out resolutions, strategies and tasks that will further my goals in these parts of my life. 2015 is when I say and emphatic YES! to my values, and that means being less reluctant to give a big fat NO to pressure to please others and go the extra mile in areas of my life that I deem unimportant or lacking. In my next post, I’ll talk about New Year’s Resolutions. In the mean time, am I the only one who is SUPER excited to be back on a regular schedule when school begins again for the kiddos? !